Thousands of snowballs have washed up on a Siberian beach, startling the locals. The snowballs, ranging in size from tennis balls to footballs emerged overnight on an 11 mile stretch of beach along the Gulf of Ob, Siberia, freaking out the residents. “We have them only in one place. It’s as if someone spilled them. They are all of different sizes, We all were very surprised,” says local Ekaterina Chernykh. The phenomenon was captured on camera by a bemused resident. Although looking like they are the work of aliens, the snowballs are in fact “snow pebbles” created by a naturally occurring rare phenomenon, whereby ice, that has broken off from a glacial sheet is rolled by wind and water into perfectly formed balls. It is a process similar to the formation of pebbles on beaches. Similar strange icy phenomenon have also been reported on the shores of Lake Michigan and also on Sebago Lake in Maine last winter. 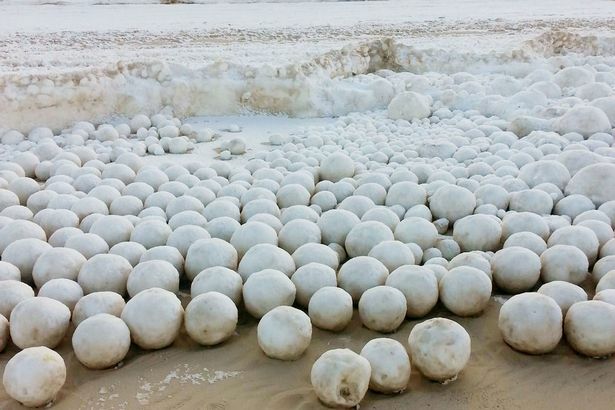 Why Are Thousands of Snowballs Popping Up on a Siberian Beach?